With four bedrooms, available for rent 3 bedrooms each with private bathroom, 1 living room, kitchen, pool and garden. The suites are all decorated with attention to detail, are spacious and airy, with natural lighting, reading lamps. Our guests can enjoy a fully equipped kitchen to prepare meals, laundry services, a private lounge with TV and free WIFI, a large garden with a large swimming pool and views of the port of Funchal, the city, the ocean and the Mountains and outdoor terraces with with tables, chairs and garden benches. Its imposing architecture with vast interior and exterior spaces makes it a unique experience, in comfort and service, we have guided four principles that we have always enjoyed especially in our accommodation: simple but high quality and generous. Personally, but careful. Little, but thought of everything and designed with attention to detail. 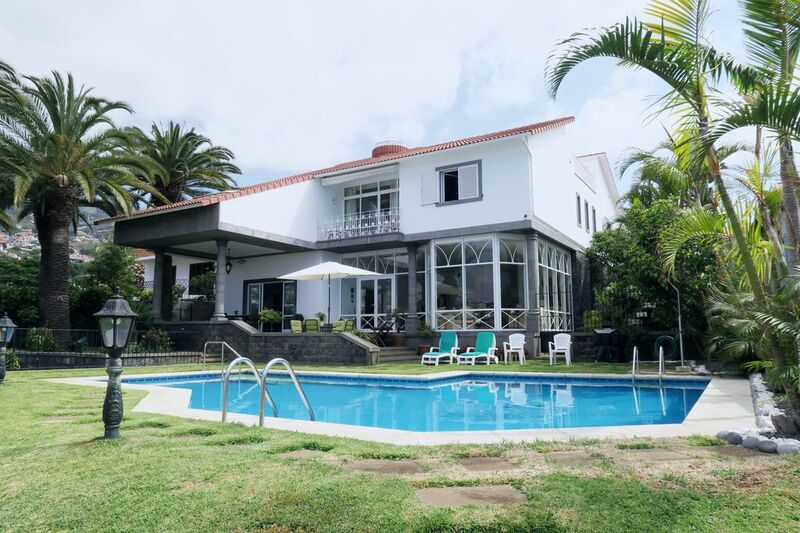 Villa Ornelas is a different accommodation in the city of Funchal 8 minutes walk from the main tourist sites (markets, farmers, old town, historic center, cable car, cafes, supermarkets, etc.) with four function rooms, all rooms have a private bathroom. Our customers are our guests. It will be with pleasure that if necessary I will be there to answer all questions and suggestions, recommend and book restaurants or visits and even accompany them if necessary. If it's your will, I'll also be looking forward to having a nice conversation when you come back after a long day to share a glass of Madeira and drink on the terrace. Transportation services or a private driver are available at any time, this service has an additional cost ask the owner or manager. The house is grand and very spacious. The owner, Filomena, is delightful - friendly and very helpful. There is more than enough room for families or groups to be together or to have time separately, and an attractive pool in the garden. Lovely house, close to everything, helpful owner. Thank you Filomena! Dear Carola and family, we were very happy to know that you enjoyed our Villa and also our services. You will always be welcome. Wonderful pool, gardens, fantastic views over Funchal , a must for anyone who loves walking and sightseeing. Absolutely beautiful. Mike and his wife Sue where a very nice couple, gentil and friendly. It was a pleasure to have them as guests. They left the house as tidy as it can be. Thank you :) You're welcome anytime. Lovely characterful house, with gorgeous views over Funchal from both the balcony, garden and lovely pool. THE most friendly and thoughtful host. We can't wait to return. All these recommendations will be given by me upon arrival. les prix de la table sont pour 2 personnes utilisant 1 chambre, chaque personne supplémentaire aura un supplément de 15 euros par personne.